Menehunes-Pepes are the Superstar Asian Division CHAMPIONS! Game 8: Menehunes-Pepes 109 defeat Primetime 76 and go 8-0 for the Asian/Gold division season. Menehunes-Pepes started off the game going on an 8-0 run and never looked back. Primetime made there comeback in the second half but the closest they got was to 16points. Menehunes then pushed the lead back to 30points then coasted the rest of the way. Menehunes ended there regular season undefeated going 8-0. Menehunes-Pepes came out firing as always. Menehunes were short on players but that didnt matter as they rolled once again. Menehunes-Pepes pulled off a close one in overtime. Things didn't look so good for them in overtime being down by 1 point with 12 seconds left until, Menehunes Hall of Famer "Mr. Big Shot" Ryan Lee, nailed a 3pointer to put the Menehunes up by 2points to pull out the 74-72 victory in overtime. Menehunes-Pepes had a shoot out this game. The game was close in the first half until Menehunes-Pepes decided to pick it up after an incident with one of Hoopers players. Menehunes-Pepes play hard and dont trash talk but when other teams trash talk and try to belittle Menehunes, it gets them more fired up. The game went from a 15 point lead to a 30 point lead in a 3 minute time span. Jimmy Miyasaka had a team high with 22points-12rebs, Mark Nitake 20points-5rebs, Mike Redding 18points-4rebs, Billy Hofman 14points-7assists-4rebs, Ryan Lee 11points-4rebs, Jun Uchiday 10points-7assits, Reuben Medina 10points-4rebs. Menehunes faced another undefeated team. This game started off close until "The Other Guys" started to trash talk with Menehunes and the rest was history. Mark Nitake woke up scoring a team high 20points-4rebounds, Ray Hong was on fire with 18points(4-3pointers), Billy Hofman had a solid game with 14points-8rebounds-6assists, Andrew Der added in his 10pints-6rebs-5assists, Scott Holbert added in 2points and 8rebounds. Jimmy Miyasaka almost had a triple double with 14points-11rebounds and 9 assists and 3 steals, but the the player of the game was Jason Murashige who went on a scoring spree scoring 8 points in a 1minute and 45second time span to help the Menehunes push their lead. Menehunes were up against an undefeated team. This game went back and forth throughout until Menehunes took the lead in the second half and never looked back. G.M. Jimmy Miyasaka led the way with 25points-5rebounds, while Andrew Der chipped in with 15points-7rebounds. Instant offense Mark Nitake added 12points-5rebs-5assists, while Billy Hofman made his Superstar basketball Season debut with a solid all around game 9points-6rebs-5assists-2steals. Ray Hong did his thing out there with 8points while Scott Holbert also made a nice season debut with 7points-4rebounds and 2 blocks. Menehunes-Pepes made it rain from the 3 point line. The team combined for 22 3-pointers. Jimmy Miyasaka had a game high 37points (11-3pointers), Reuben Medina had 23 points(3-3pointers), Dae Han had 20points(2-3pointers), Andrew Der had 17points(3-3pointers), Pierre Recinto 8points (2-3pointers), Ray Hong 5 points (1-3pointers). Menehunes advance on to 2-0 for the season. Photo by: Hanz Jimenez Superstar Basketball. Menehunes-Pepes were short handed this week but that didnt stop them from racking up the points in Superstar Basketball Asian Division. 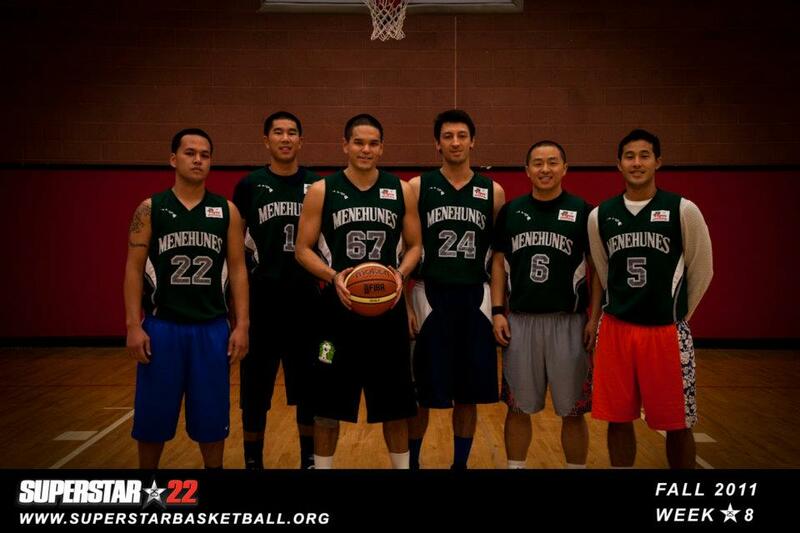 Menehunes had 5 guards out there: Jun Uchida, Mark Nitake, Reuben Medina, Jason Murashige, and Ray Hong. From the get go the Menehunes played excellent defense which lead to easy offense. Kicks tried to throw some cheap shots at the Menehunes but that only fired up them more to put more points on the board. Menehunes are trying to acquire league commissioner Hanz Jimenez, but he chose to play for kicks because he wants a shot at Menehunes. Hanz did hit 2 3pointers on the Menehunes and G.M. Jimmy Miyasaka said "Hanz, would be a nice fit for this team with his 3 point range"
Menehunes were without some key players: Mike Redding was sick this past weekend, Hall of famers Ryan Lee due to work obligations and G.M. Jimmy Miyasaka who is taking care of his health concerns, but he is there on the side line coaching the Menehunes. Mark Nitake led the way with 42 points, Reuben Medina and Jun Uchida each added 19points, while Ray Hong and Jason Murashige each had 10 points. Key standouts for Fresh: League commissioner Hanz Jimenez had 6 points in one minute, 2-3point swooshes... Good thing Commissioner Hanz Jimenez was busy taking photos of the game and the other game and we didnt let him get going in the first half, the game would of been a different story! 6points in 1 minute, multiply that by a 40 minute game and that is 240points! Menehunes need to sign Hanz Jimenez! WALNUT REC – 3:00 p.m. Dirty Girls 4 Life weren’t able to commit to Superstar and Menehunes took on a scrimmage last week for their season opener. This week, they take on Kicks, a team that headlines Center Harry Yoo. It’s unknown who will join Kicks but sources say the Commish declined an invitation to join Menehunes to play for Kicks late last week. “Menehunes is a stacked team, that’s the kind of team you want to play against, not join,” said PG Hanz Jimenez. “There’s a lot of talent there, but we’re ready for the challenge. 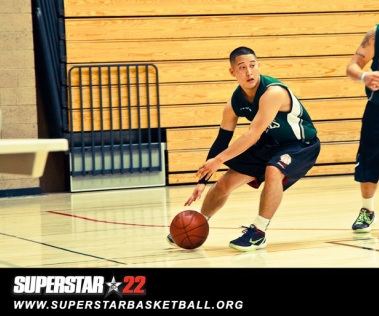 FAST FACTS: Jimmy Miyasaka was named a Diamond Division All Star when he played for Taiwan Center a year ago. Miyasaka will be sitting out this season and he will be coaching from the sidelines. Menehunes will be without G.M. Jimmy Miyasaka due to a health issue called Rhabdomyolysis=muscle breaking down. Menehunes will be out there battling to keep there winning streak alive. Game will be rescheduled. Pepes-Menehunes played against another team in an exhibition game and won 111 to 47. A good warm up game however next week will be a tough game vs. Dirty Girls 4 Life. The Menehunes came out with a different roster.